Imagine a New England vacation and odds are you’re imagining lazy days on the beach with fried clams for lunch. Or leisurely leaf-peeping drives through impossibly quaint small towns. But in my mind, the region is just as compelling in the winter — especially when bundled up in a cozy inn with no plans more urgent than watching the snow fall. 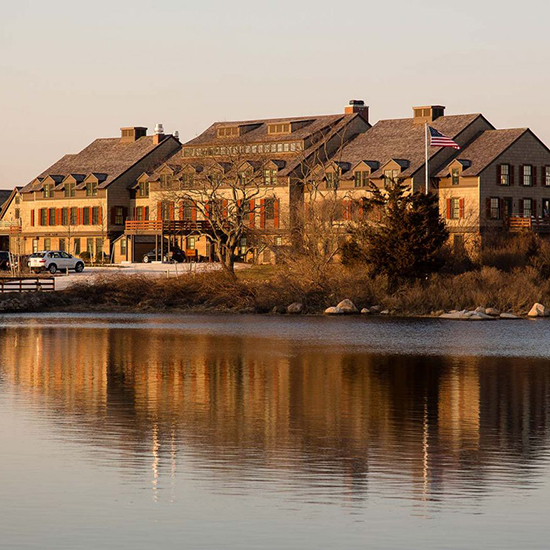 Perched on Block Island Sound on a pleasantly remote stretch of Rhode Island coastline, the Weekapaug Inn manages to feel like a private home, despite, at 31 rooms and suites, dwarfing nearby summer homes in the charming seaside community. First opened in 1899, the Inn was a family-owned property for four generations — first in a beachfront location fully exposed to the elements, then, after sustaining damage in a 1938 hurricane, moving to a more sheltered site just down the shore. Due to financial constraints, the Inn closed in 2007, after more than a century in business, only to be purchased and brought back to life by two Rhode Island residents in 2010. Now a Relaix & Chateaux property, the Weekapaug Inn was restored to higher standards than ever. In warmer months, Quonochontaug Pond, steps from the inn, is dotted with sailboats, but come winter, when the summer homes shutter, guests at the Weekapaug Inn feel as if they have the entire landscape to themselves. Bundle up and you might walk miles along the beach without seeing another soul. Even during the winter, Weekapaug’s Naturalist leads guests on outdoor excursions, whether birding walks, beach walks to spot local wildlife, or stargazing sessions. Inside, fires crackle the inns libraries and lounges. Warm chocolate chip cookies appear in the afternoon in the generous (and complimentary) snack alcove. Staff are always on-hand to add wood to the fire, or suggest a walking path — or just leave you to contented silence, reading a book in an antique rocking chair. While the light-filled Fenway Suites, with private sundecks and outdoor soaking tubs, might be the best place to spend a summer afternoon, in the winter I preferred being tucked up under the eaves on the top floor, with near-panoramic views out onto the pond, even from the standalone bathtub. It’s easy to relax into the Weekapaug Inn’s unhurried vibe, spending a cozy day within its confines. So it’s a particular delight that it houses a stellar restaurant — known simply as “The Restaurant” — with a seasonally changing New England menu. Still, the highlight was yet to come. While a number of desserts looked enticing, nothing could top s’mores — for which guests are brought out to a blazing fire pit under the stars, a helpful staffer on-hand to mind the flames and ready the graham crackers. Cold is no deterrent; the Weekapaug will light that fire all year round (barring extreme weather, of course). I nursed the last of my Grolleau while roasting two marshmallows to a perfect golden brown, hands and face warmed by the roaring flames. And as I looked up to see flurries fall — the first snow of the season — I wondered why, exactly, I planned on leaving the Weekapaug Inn at all.